Crystal Chandeliers look stunning in bedrooms however often a little too feminine to pleased both partners. Problem solved! the delightful 'Mime' pendant semi flush chandelier marries the masculine brushed nickel angular framework with a translucent sheer drum shade and tapered crystal droplets. It's just lovely, perfect for bedrooms, dining rooms and entrance halls. 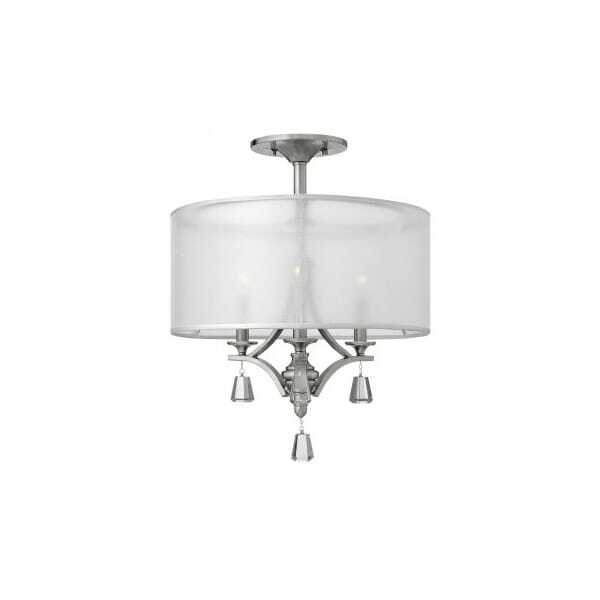 Semi flush ceiling lights are great for rooms of average height. Allow for a drop of at least 2ft with this light. Please keep in mind it still needs to be above head height unless above a dining table where a lower hanging light may be suitable.